NH-91 Widening work has started as the contractor sets-up the hot mix plant at Khurja. The NH-91 highway widening to 4-lane is being undertaken by NHAI on PPP model and is expected to cost 1750 crores. The contractor, PNCIL (Pradeep-Navin-Chakresh Infra Ltd) would bear all the construction cost aand would charge toll on the road till year 2032. 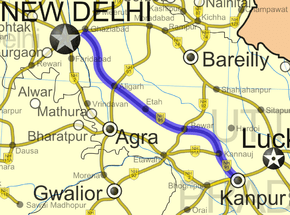 National Highway 91 (NH 91) is a National Highway in India entirely within the state of Uttar Pradesh. NH 91 links Ghaziabad, on the outskirts of New Delhi to Kanpur. The total length of NH 91 runs to 405 km (252 mi). Starting from NH 2 in Kanpur it runs northwest and ends at Ghaziabad near to Delhi at NH 24. The highway passes through Kanpur, Barrajpur, Bihaur, Makkanpur, Kannauj, Gursahaiganj, Chhibramau, Bewar, Bhogaon, Kurawali, Etah, Sikandra Rao, Aligarh, Arnia, Khurja, Bulandshahr, Sikandrabad, Dadri, Ghaziabad.